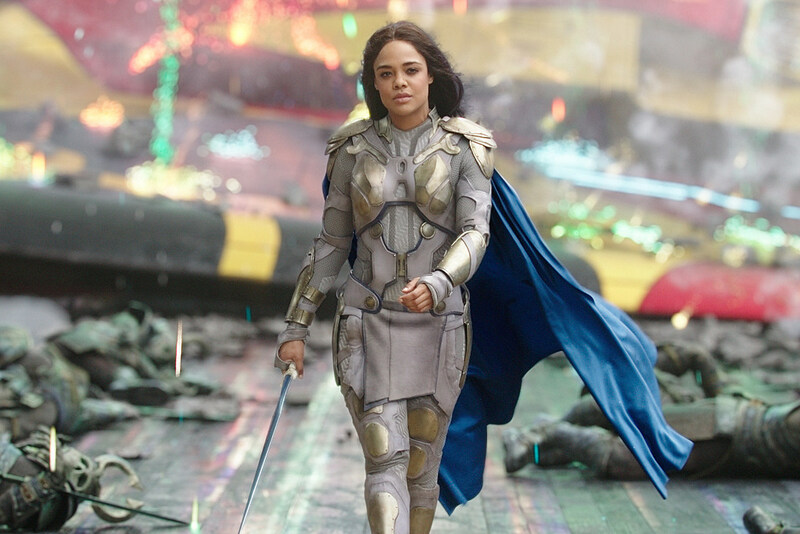 Tessa Thompson shared major news last week when she revealed her Thor: Raganrok character Valkyrie is bisexual, making her the MCU’s first openly LGBTQ superhero. But as it exciting as the reveal was, it’s a disappointing story we’ve heard before: a character is queer in the press, but far from it onscreen. When you see Thor: Ragnarok this weekend (read our review here), don’t expect any mention of Valkyrie’s bisexuality. The movie doesn’t directly allude to it, which, granted, Thompson clarified over Twitter, but (minor spoiler alert) her warrior instead shares some flirtatious moments with Chris Hemsworth’s God of Thunder. However that total lack of acknowledgement wasn’t always the plan, and a cut moment from the Taika Waititi movie initially winked at Valkyrie’s relationship with a woman. But Ragnarok did originally include a more overt gesture towards Valkyrie’s sexuality. Thompson convinced the Kiwi director to shoot a glimpse of a woman exiting Valkyrie’s bedroom. According to the magazine, Waititi kept the shot in “as long as he could,” but eventually “the bit had to be cut because it distracted from the scene’s vital exposition.” Hm. I do want to applaud both Thompson and Waititi, especially considering the director apparently tried to keep the shot, but it’s still disappointing to learn. On one hand, if the moment was indeed just a “glimpse” as described, could it have really been all that distracting? Yet on the other, even if it was distracting, well, good. If a major studio like Marvel is going to introduce their first LGBTQ character – and most notably, one who is a woman of color – it should be distracting enough to merit attention. Studios should proudly stand behind their queer characters and not be afraid to celebrate them for who they, supposedly, are, or else how can we expect audiences to? More and more recently studios have been coyly sneaking in oblique allusions to their alleged queer characters, from John Cho’s Sulu in Star Trek Beyond to the Yellow Ranger in Power Rangers to Josh Gad’s “exclusively gay“ Le Fou moment in Beauty and the Beast. (And let’s not forget Marvel shutting down any notion that Danai Guriria’s Okoye and Florence Kasumba’s Ayo will be gay in Black Panther.) It’s not just frustrating to see these queer characters reduced to subtext while their heterosexual counterparts get full-on romance plots on screen, but suggests a progressiveness in Hollywood that simply doesn’t exist. Actors and filmmakers often boast in the press about their queer characters, but the number of actual LGBTQ characters in movies is hardly improving, and in 2016 made up a mere 18.5 percent of major releases. If studios are going to introduce an LGBTQ character, and if they want the brownie points for doing so, they have an obligation to do it explicitly (and, it goes without saying, respectfully), or else it just doesn’t count. It’s awesome that Thompson was the one who advocated to make Valkyrie bi, and maybe change can begin with more actors taking similar initiatives. It’s especially encouraging that Waititi originally included a nod to it in the film. But a nod isn’t enough, especially if it ends up on the cutting room floor. So if the MCU actually wants to have its first LGBTQ superhero, the studio ought to make a real effort to represent Valkyrie for who she is in future appearances, or just give her a girlfriend in the spinoff she so deserves. Thor: Ragnarok hits theaters November 2.